Wafaa Afkir worked as a freelance translator with Khaleejesque online magazine. She has worked as a phone counselor with Morocco Order in Casablanca and with Peace Corps as a Language and Culture Facilitator. During college, she volunteered with Casablanca-Kennesaw community museum for a year and with ‘Darna Association’ a women’s center in Tangier. In 2007, she taught Arabic and English with Hiba Association. 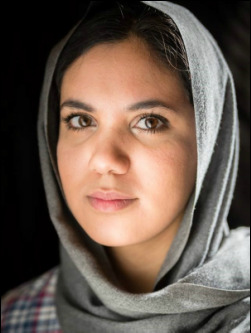 Wafaa helped organize several events, including The International University Theater in Ben m’sik, Tangier Theater Festival, Women’s Day in Casablanca, and Coffee and Conversation in Ben M’sik and she will be representing Morocco at The Mosaic Leadership summit 2013 in the UK. 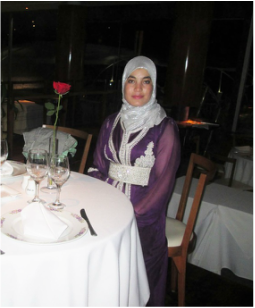 Wafaa graduated from Moulay Ismail High School in 2007 with a bachelor’s degree in American Studies from Hassan II University and she studied translation at the King Fahd School of Translation. ​Abdessamad Ait Dada graduated from Mohammed V University, English Studies Department, after which he studied anthropology for six months at the Dutch institute in Rabat (Nimar) and then took different job positions. First, working with Peace Corps Morocco as a Language and Culture Facilitator (LCF), then, as a Language Consultant of Amazigh at Kansas University in the US. He also worked as a translator, tour guide, and English tutor. Most recently, he was an Arabic Language Partner at Amideast in Rabat. Bouchra Kouryani is from Bouanane in Figuig Province of Morocco. 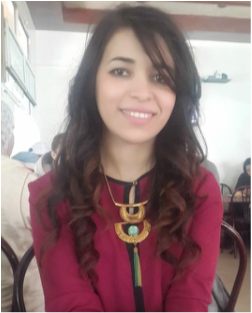 She studied English in Oujda and finished her studies last year. Since then, Bouchra has volunteered extensively in her community and served as the coordinator of Bouanane’s Youth Council. She enjoys reading, traveling and walking in nature and hopes to become a teacher. Salma Moumou graduated from Caddi Ayyad University in Marrakech with a Bachelor’s degree in French literature. After graduation, she worked as a customer consultant at phone group in Marrakech and afterwards for Dell in Casablanca. Her most recent professional experience was in AXA Service Maroc as a consultant. 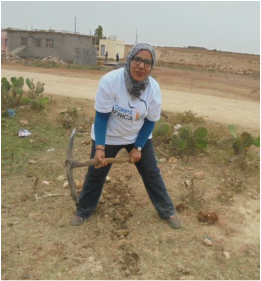 Salma has been involved as a volunteer with Junior Chamber International (JCI) since 2011 – she was an active member of JCI-Marrakech for different areas, Secretary General of JCI-Casablanca, and an active member in the training area of JCI-Rabat. Hiba Tazi is Development and Communications Assistant in the CorpsAfrica DC headquarters. 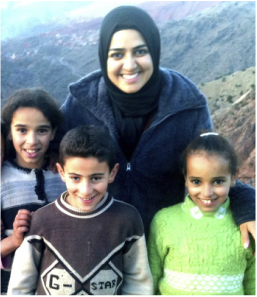 She was a CorpsAfrica Volunteer in Morocco from 2013-2014, where she lived in the High Atlas Mountains south of Marrakech and helped her village build a preschool and the women create a rug cooperative. She is originally from Casablanca and graduated from the University of Texas at Austin, where she received a Bachelor’s of Science in Human Development and Family Sciences/pre-med, with a minor in French. During college, she was actively involved in numerous service organizations and took on multiple leadership and volunteer projects. She has interned at several facilities including The Beehive of Austin, an after-school program for underprivileged children, Richardson Medical Center, Austin’s Grace Hospice and the International Rescue Committee, where she coordinated English classes and donations. She has also worked as an Arabic and French tutor. Malika Boukbout has worked with the US Peace Corps since 2001 – as a Language and Cultural Facilitator, Trainer of Trainers, Home-stay Coordinator, Certified Language Tester, Health Liaison, Training Assistant, and more. She taught literacy classes for women in Errachidia and went to the US as a translator with the Moroccan Women Caravan Project in New Orleans, where she also worked as a Cultural Facilitator. She has a BA from Meknes University Moulay Ismail. Soukaina Bouihi is from Ouarzazate, Morocco. She graduated from the faculty of Ouarzazate in 2013, with a BA in Foreign Languages Applied on Commerce and Communication. 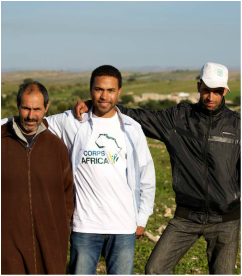 She served as a CorpsAfrica Volunteer in Morocco from 2013-2014. 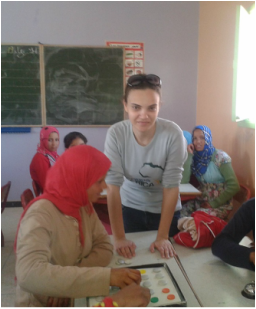 Soukaina represented Morocco in a women's leadership program in Kansas, USA, in 2012. She worked as reporter for Global Girl Media, which is an international organization that works with young women to report on women's and youth news using social media. She is a co-founder of Ouarzazate E-news, a local newspaper that reports the daily news of the Ouarzazate community, and a board member of the association E news. Soukaina is currently serving as a CorpsAfrica Volunteer in Malawi.